You incarnate a divinity of “Manami” Island lusting for the succulent pineapples that grow there. But this won`t be an easy task, as there is another divinity that can appreciate the golden fruit! Your divine powers will collide, as only one can have the majority of the fruits before the harvest season ends. Tiki is a beautifully illustrated 2-player abstract game and the first thing I noticed is that it would look good on any person’s shelf. I like games that use vivid colors and seem carefully produced. Let’s jump into the gameplay of the game! The goal of the game is to be the first to gain four juicy pineapples! Create a new totem by placing one of your tiki on an empty village card. Move one of the totems that you control. A totem is considered controlled by you, if the tiki on the top is yours. To move a totem, you have to take all the tikis of that totem and start moving them from village to village, leaving the lowest tiki on each move. During this movement, you can only travel vertically or horizontally from one village to another. This tactical movement can have a big impact on the totems in play, altering possessions and forcing village powers to be resolved, which is the phase that we will get into now. To resolve a village, it has to be “influenced”, thus, having a totem made of three tikis on it. 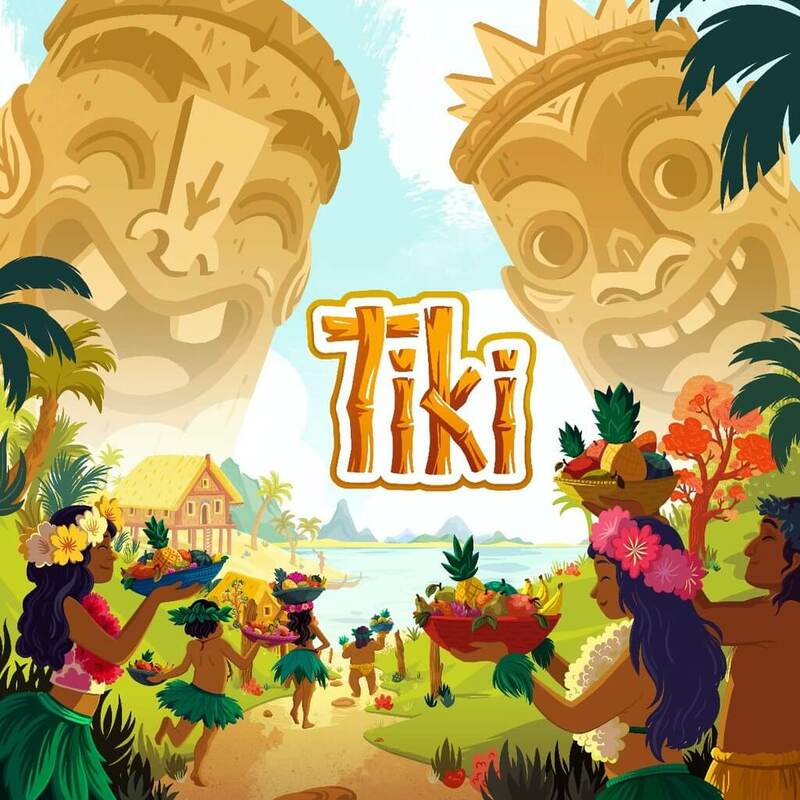 The effect applies to the player that controls the totem that influences the specific village and then all three tikis return to their owners’ reserve. There are nine village tiles on the game divided into four types that let you: gain two fruits, gain one fruit, gain nothing or lose one fruit. Lastly, the game comes with a more experienced variant of the game adding a “Shaman” effect on a village that has no effect on the classic mode. This shaman has a token that can be placed or be moved between villages and blocking tiki movement between those two tiles. I am personally in love with the art and graphic design of the game, another breathtaking work from a French artist. Overall it’s a light and fun tactical game that you can teach in a few minutes and play with anyone. If you are interested in a 2-player refreshing experience, be sure to check out its Kickstarter page here!